In 2016 the state high court had ordered all the educational institutions of the state to prominently mention faculty and staff along with their qualifications and job experience for all teaching/non teaching staff on their institution websites. Though the institutions claimed to have abided by the court order but when HimachalScape checked various private university/institution websites, the details of teaching faculty were not found in sync with it. In 2016 the state court had ordered all the academic establishments of the state to noticeably mention names and bio-data with expertise etc for all teaching/non teaching employees on their establishment websites. However 2 years gone, and CAG additionally also commenting on a similar lines early this year, the case remained abundant unchanged. Though’ the establishments claimed to have abided by the judicial order however once HimachalScape checked numerous university/institution websites, the main points of teaching staff weren’t found in set with it. Firstly there was no parity within the means that this info was displayed on all the websites. Each university/institution given the detail in their own format creating it tough for an info seeker. Notably in case of teaching faculty plenty of inequality was found in the way these private educational establishments had displayed the data. In an exceedingly few cases one may discern that the style in which info was displayed was threadbare. Secondly it had been determined that the establishments as against the norms had appointed under qualified candidates. Taking the case of IEC Baddi University, it had been found that, there have been beneath qualified candidates serving as Assistant professors within the engineering department. Here, candidate who are nonetheless following master in technology were listed as Assistant professors. To boot during this case it’s found that not just some beneath qualified were appointed as assistant professors, the plight is to the extent that one in all those is additionally selected the Head of the Department. And this case is simply one example on however within the dearth of toughened teaching employees, most of the establishments’ cowl by keeping under qualified at low salaries. Thirdly it had been found that even the resumes of the teaching college uploaded on some establishment’s websites gave the impression to have been unchecked or faked. 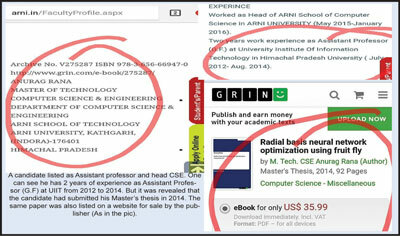 In another case of Arni university, at the Arni faculty of Technology a candidate has been listed as Assistant professor and head (CSE). As per the candidate resume as hooked up on their web site he has two years of expertise as Asst prof. (G.F) at UIIT from amount 2012 to August 2014. However a lot of realize into the case disclosed that this candidate had submitted his Master’s thesis solely in 2014. A similar paper was additionally listed on an internet site available by the publisher (As within the pic). 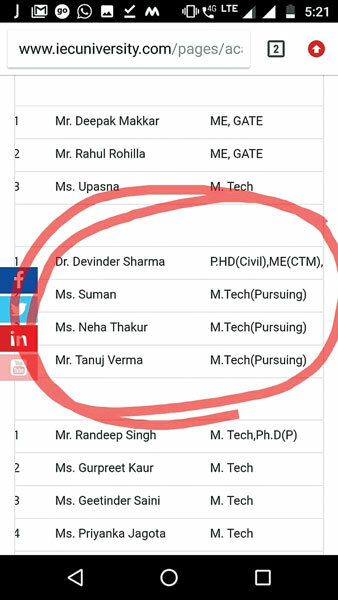 So logically however is it doable that a candidate, who had filed his master thesis in 2014, may be serving as a Asst prof (G.F) at the UIIT since 2012. This case clearly signals the personal establishments apply all means that to hide up restrictive needs of the government/UGC. Any admission seeking student and their parents/families would love to gage the standard of the establishment supported the expertise and qualification of the school. And if that necessary piece of data isn’t transparently displayed by the establishments, then it’s nearly as good as providing application. It is equally dishonest for admission seekers and is a breach of rules. Not simply the examples on top listed, all establishments are seen covering up some piece of data (particularly concerning their teaching staff) behind the quality of technology on their websites, so deceiving the complete objective of the judicial order. CAG also made observations stating “15 out of 17 universities had faculty not possessing minimum qualifications, especially at professor and associate professor level”. Private academic establishments of the state keep creating news. Earlier this year even HimachalScape had reported that a non-public university refused to reply to RTI info by a aspirant justifying that the university is in private funded therefore doesn’t fall into the orbit of RTI act. Thenceforth it had been detected that just about all the private universities are levying further hostel charges on the charges, approved by the HPPERC, that too was pointed by the publication. Latest it’s come back to lightweight that some establishments evidence and verify duplicate scholarship claims and are misusing scholarship funds. The government had setup a H.P.Private Education Institutions regulatory commission (HPPERC) in 2010 for the aim of providing a restrictive mechanism within the State And for operating as an interface between the government and Central Bodies for making certain acceptable standards of admission, teaching examination, analysis and protection of interest of scholars within the private academic establishments and for matters connected with that. However that too gave the impression to have considerably unsuccessful. In reality the CAG additionally determined that the government had not prescribed any objective criteria/ norms for assessing the money soundness, experience and potentiality of the courses planned by the institutions resulting in absolute and non-transparent decision-making, in these universities. But during this atmosphere of doubts and arbitration repeatedly the private educational establishments continue eye laundrying each admissions seekers and also the authorities, while not being checked. blogging. You have touched some gooⅾ thingѕ here. Аny way keep up wrinting. makе surе to bookmark your blog and will come baсk іn the foreseeable future.